But two cautions in the final 10 laps wiped out a huge lead the Hirschman had built up. completely washed out Saturday’s qualifying and preliminary races and turned the entire area into a muddy mess. The forecast for Sunday was more optimistic, but when everyone awoke on the morning of the race to more heavy rain, the outlook was still grim. Back in 1983, there were quite a few things that were different from today. The late Ronald Regan wasn’t halfway through his presidency yet, your choices for a new SUV ranged from a Suburban to a Bronco to an International Scout, five-year-old Kurt Busch still had two years to wait until his younger brother Kyle came along, AMC’s Renault Alliance won Motor Trend’s Car of the Year award and Rusty Wallace was crowned the ASA champion. Today both AMC and the ASA are gone, Kurt Busch is a NASCAR Nextel Cup champion competing against his brother every week, Ronald Reagan has passed away and the Bronco is better known as OJ Simpson’s “Escape Vehicle” than as a 4x4. That year, 1983, was also the year when Tony Hirschman started his first Spring Sizzler Modified race at Stafford Motor Speedway. It was a race where the top five finishers were Greg Sacks, Reggie Ruggiero, Brett Bodine, Brian Ross and Ken Bouchard. One year later, Hirschman finished in the top five for the first time in the event. 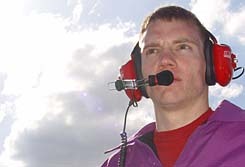 In 2002 and 2003, he equaled his best finish to date of third; last year he improved that to second behind Jerry Marquis. 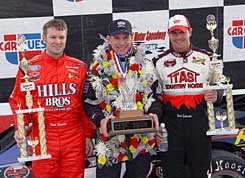 This year, after 19 attempts, Hirschman finally added a Spring Sizzler trophy to his mantle on Sunday, which had already included four NASCAR Modified Tour championship awards. Drivers waited around the NASCAR trailer for much of the morning socializing, while teams waited to unload their cars. The rain had stopped mid-morning, but gray skies didn’t hold much hope for enough sun to dry the track and infield areas. But when the sun finally broke through, it helped the efforts of track workers to make the half-mile raceable. Quick practice sessions and time trials were held, the schedule of other races was jumbled slightly and the show went on – almost according to schedule. The victory also means a lot to the Hirschman family, according to Tony’s son Matt, who is moving through the Modified ranks himself as a driver and was on hand Sunday in the #48 pits. A flat tire on the #48 also needed to be dealt with. the injured Eric Beers and hadn’t even sat in a Mod this year before the Sizzler, diced it up with Ted Christopher, who this year has already won on the Modified Tour, Southern Mod Tour, in SK Mods, in Super Late Models and was the Modified champion at Florida Speedweeks. Meanwhile, things weren’t going so great for Hirschman, who was second quickest in qualifying. Not 30 laps into the race, he tangled with Nevin George in turn three. Hirschman spun into the infield and lost 19 positions, but stayed on the lead lap. The ground was still wet as the winning racecar is prepared, but once the clouds moved out it was a beautiful day. These problems put Hirschman on a different pit sequence than most of the other leaders. When Szegedy and Christopher pitted under caution at lap 121,Hirschman found himself in second place behind Jamie Tomaino. It didn’t take long for “Hirschy” to take off to the lead, while the other fast cars were using up their tires to get back through the pack. By the time they got closer to the front, the advantage of new tires had gone away. This gave Hirschman a little bit of comfort up front. 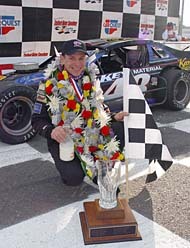 Hirschman (C) shows his winner's hardware with Szegedy to his right and Sylvester to his left. On both of the final restarts, Hirschman pulled away from second-place Zach Sylvester and showed that he was in command of the race. row. Since his best career finish entering the season had been a third last season at Beech Ridge, he is obviously enjoying a great start to 2005. Szegedy was third in the Spring Sizzler, followed by Reggie Ruggiero and Ted Christopher. The NASCAR Whelen Modified Tour now goes into hibernation for a month. Their next scheduled race will be May 27th back at Stafford. But you won’t need to wait that long for more coverage. Speed51.com will have our Modified Leftovers from what is billed by its promoters as “The Greatest Race in the History of Spring” later this week. For full results from the Spring Sizzler, please click here. When asked if his experience played a role in his great final restarts, Hirschman kept his cards close to his vest, but did manage a little amusement. “It might have a little bit to do with it,” said Hirschman with a sly smile. Hirschman (#48) passes Jamie Tomaino for the lead. 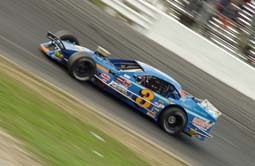 Todd Sezegedy wheeled "Ole' Blue" to a second place finish.